When you want to make a plan with friends you need to – discuss the ideas, get them to join in, track who’s in and out, and when everyone is ready, someone backs out at the last moment, and it becomes too difficult to execute. If you’re lucky enough to dodge this problem, then the other thing occurs when you discuss bills, expenses, and it certainly feels uncomfortable to poke them about the money they owe you. To be frank, we all hesitate to ask the money back from the friends and regret it later on. However, I stumbled upon an excellent app that has answers for every problem – ‘Mypoolin – Split & Share with Friends‘. 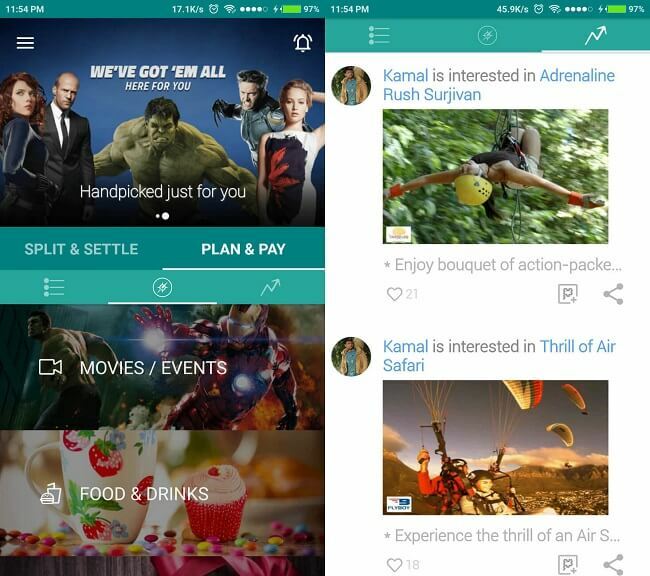 It helps you plan for food, travel, movies and pay for all these with friends right from your mobiles’ screen. 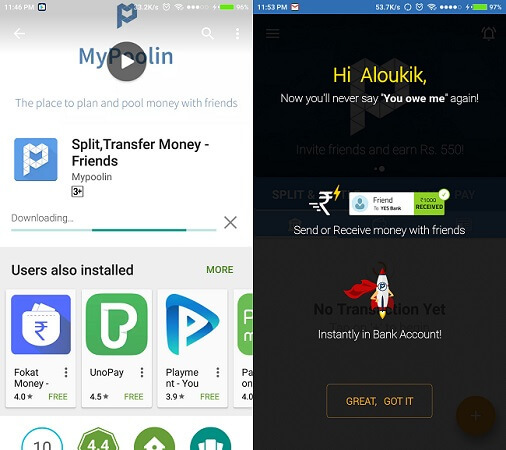 So let’s dig in and review the social payment sharing app – MyPoolin. This very “Jugadu” idea is a great solution for all those minor problems of proper distribution of money among friends. Suppose, you’re going to a movie, club or any other place, then this app would help you all. Mypoolin helps you with payments with friends with its innovative idea and ease of payment for the sharing of bills and expenses. Chat with each other, create a plan, discuss with everyone, and share the cost. The app lets you pay for Movies, Shows, Dining, Gifts, payments, traveling from your credit/debit cards and much more. To get started with all that planning chit-chats and that massive brainstorming, you’ll need to download mypoolin application on your device. Fortunately, the app is available for both Android and iOS. The app is free and offers dozens of excellent features without even costing you a dime. The app requires devices with Android 4.2 & up and iOS 8 for iPhone. So, compatibility wouldn’t be much of an issue for the users. The app greets the users with a very simple user interface and lets you create multiple groups for various plans, hangouts, etc. Also, MyPoolin syncs the contacts for the ease of sharing the plans and bills. The application has a colorful but descriptive interface. You can start the discussion by choosing the plan idea, say watching a movie, then in the ‘Split and Settle’ section; you can pay the entire amount and generate a request for all the friends to share the amount. For this, you’ll need to add the friends with whom you’re going to share the bill, but they must use MyPoolin too. For the non-users, the app sends an invitation request. Once the requests are made, your friends need to pay their share of the amount through a secure pool. You can then collect back all the money which you’ve paid on your friend’s behalf from the app. If your friends decline to pay, then you can resolve the matter or any other issue in a group chat. You can redeem the payment later on. Another section allows creating and reserving future plan pools for several categories like ‘Gifting,’ ‘Food & Dining,’ etc. For transactions and payments ease, MyPoolin has partnered up with multiple wallets like Oxigen, Paytm, Mobikwik, PayPal and many others. You can also pay by various credit and debit cards across different banks. Also, the app has a referral program to earn credits by referring it to friends. Credits can be used to buy online vouchers. The app also has tons of other minor features and option that makes your planning simpler. For ex, the ‘Explore’ feature allows you to discover new events, parties for you and your friends near you. You can also reserve tables and book seats in the Dining & Movie sections for the ease. Lastly, the app has a feed which displays all the latest pools your friends are indulged in. You can also purchase gifts from MyPoolin App. 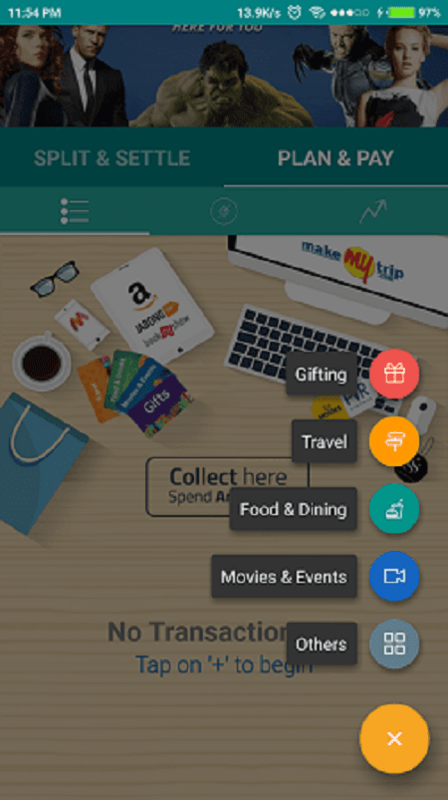 So, this was my share on MyPoolin, and now it is your time tell me that whether you’re going to plan all your hangouts and movie ideas with this app or not. Cheers!